A woman in an Afghan chadri, otherwise known as a burqa (in Arabic), stands in front of the beautifully decorated mosaics at the Friday Mosque in the western Afghanistan city of Herat. In March, 2019 Inertia Network led an expedition around mainland Afghanistan. We experienced the hustle and bustle of Kabul, drove across Parwan Province to the Bamyan Valley and Band-e Amir National Park, and then continued by road over the Selang Pass to the northern city of Mazar-e Sharif. 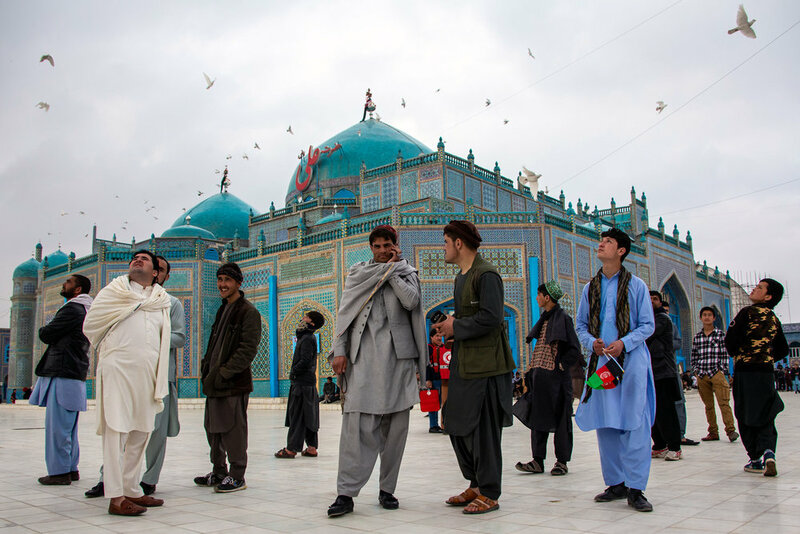 There, we celebrated Nowruz— the Persian New Year— with locals at the Blue Mosque, before flying over to the Persian-influenced city of Herat in the far west of Afghanistan. This was our first expedition to Afghanistan’s Mainland and the experience meant a lot for everyone in the group. We were there to learn and spend time with Afghanistan’s people, to understand the impact of trauma and the resilience it has led to, and what may be in store for the future of this remarkable land. These images were all taken during the trip. If you’re interested in visiting Afghanistan, just reach out and we can help design a trip that’s right for you. Colourful homes hug the mountainside in a Kabul suburb. This sprawling city of over five million people is Afghanistan’s political and cultural capital and is a mixed salad of the country’s ethnic groups. Pashtuns, Tajiks, Hazaras, Uzbeks and Turkmens may all be found in the city. The traffic is also insane. A security helicopter flying just overhead scares a flock of birds over Mazar-e Sharif’s blue mosque during the Nowruz celebrations. The game of Buzkashi is a traditional game placed in Afghanistan and other Central Asian countries on horseback. Riders compete to carry a decapitated calf or goat into a goal zone. The referee can be seen running away from the stampede of horses after dropping the beef in the central circle. The winner is the horseman able to carry the beef back into the centre of the circle. Balkh Province, Afghanistan. The people of Afghanistan have existed at cultural crossroads forever, and are a part of the process of centuries of migration. This can be seen even in their genetics, as bright blue eyes are not unusual in Afghanistan. Here, a Hazara man with piercing blue eyes looks into the camera when he noticed my interest in his eyes. The Hazara people can trace much of their lineage to Persian settlers and Mongolian invaders throughout the history of Afghanistan. A chadri (burqa) salesman poses next to his newest customer at a burqa shop in the northern city of Mazar-i Sharif. The chadri has been worn by Pashtun women since before Islam arrived in Afghanistan. While it became a rare to see the garment in the cities during the swinging 60s, during the Taliban years the chadri was made mandatory for women to wear in public. Today is is relatively common still, although there is significantly more choice for women in urban areas of Afghanistan. A girl poses for a selfie at the Blue Mosque in Mazar-i Sharif. Cell phones are extremely popular amongst middle class and urban Afghans and they particularly love using social media apps like Facebook and WhatsApp. A boy flies his kite in front of his neighbourhood in a Kabul suburb. Kites are still a very important part of childhood memories of many Afghanstanis, and kite running season is typically in the Spring and Fall. A Kabuli family takes a look over the city of Kabul from Bibi Maroo Hill in central Kabul. Kabul is surrounded by the Hindu Kush mountains and as the city grew, many neighbourhoods simply expanded onto the mountain faces. An old man sits under an archway at the colourful Friday Mosque in Herat. Nicole stands at a very frozen, wintery Band-e Amir lake. This is Afghanistan’s first national parks and is home to some of the country’s most stunning scenery. In the summer, these turquoise lakes stand in stark contract to the dusty countryside of central Afghanistan. In the winter, they freeze over, as here in Bamyan Province, the altitude in the Hindu Kush mountains is around 3,000 metres. 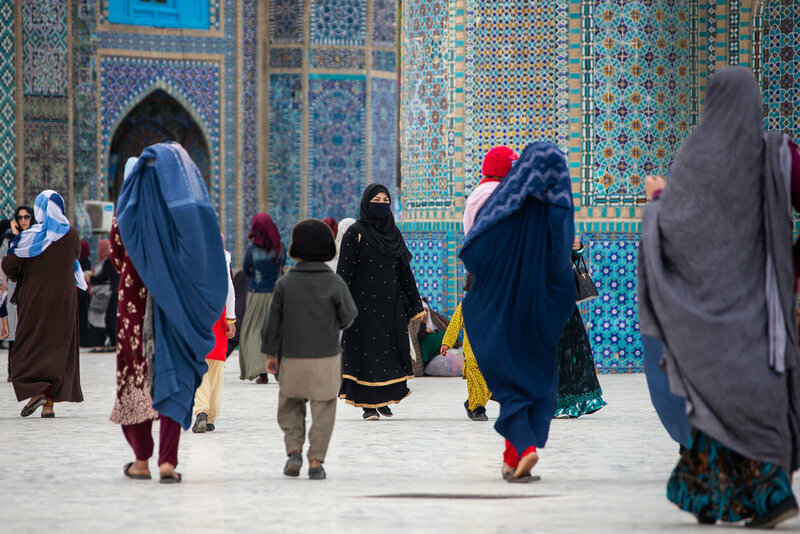 Three women in blue chadris walk in front of the interior of Herat’s Friday Mosque. The great Buddha Niches of Bamyan were largely destroyed by the Taliban in 2001. Despite international condemnation, the Taliban destroyed this world heritage city dating back to the 5th century because they saw the statues as anti-Islamic. Today, the niches sit largely empty. Some statue outlines may be seen and remnants of colourful paintings can be found inside some of the caves. While others are covered in ash from people having been living in them and others in graffiti and footprints defacing some of the ancient Buddhist paintings. An ethnic Uzbek grandfather watches a Buzkashi match outside the city of Mazar-i Sharif in Balkh Province. Two men take a rest in an archway at Herat’s Friday Mosque. Afghanistan’s far western city of Herat lies close to the country’s borders with Iran and Turkmenistan. The city is culturally very Persian, and was a major trading post on the Silk Road. It is also famed for its artisans, especially the tile work. This man is using a pick to shape a coloured tile in the Timurid style. Herat’s Friday Mosque has its own tile production and mosaic production factory. While normally unsegregated, duringt he Nowruz holiday there were so many people at Mazar-i-Sharif’s Blue Mosque that authorities deemed one side of the courtyard for women and the other for men. Here’s a view into the women’s section of the courtyard in front of the tiled mosque. An ethnic Tajik grandfather and grandson pose for s sunset picture in Parwan Province’s Panjshir Valley. The Panjshir is part of the Tajik heartland in Afghanistan and was the home of the Tajik mujahid fighter Ahmed Shah Masood, who defended the valley and Afghanistan’s northeast from the Taliban. He was later killed in a terrorist attack in 2001, and his mausoleum is here in the Panjshir. Ghorid architecture is a real treat to find. Named ofter this unique region in central-western Afghanistan, much of the country’s unique Ghorid designs were covered up by Timurlane as he conquered the region. However, during a restoration project at Herat’s Friday Mosque, the original Ghorid designs were uncovered and today a small section of the old mosque can be seen. A man looks on with awe just after sunrise at the Blue Mosque in Mazarr-i Sharif. 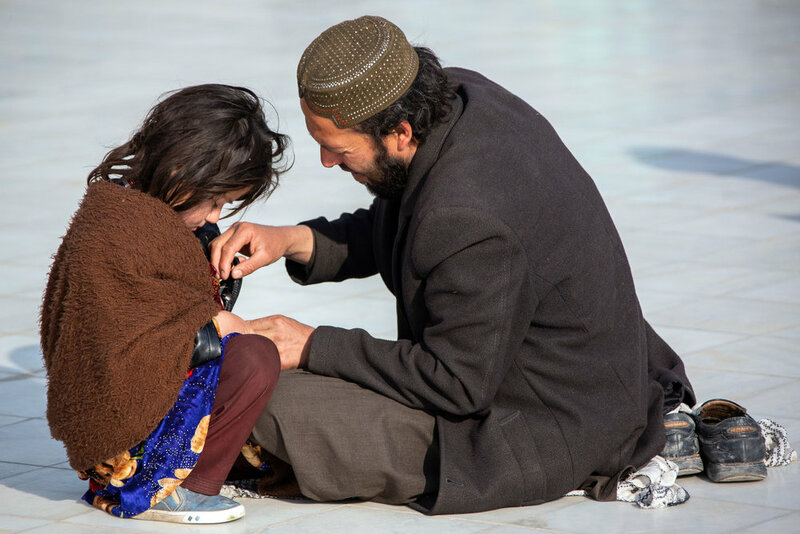 A father helps his daughter with her clothes in Mazar-i-Sharif. Much of Afghanistan is mountainous, with the Hindu Kush forming the largest range in the country. High peaks and deep valleys have made the country difficult for invaders to conquer from ancient times till today. The Hindu Kush literally means the “killers of the Hindus” as invaders from India were unable to successfully cross the range. A man takes a rest against a colourful mosaic wall at the Blue Mosque in Mazar-i-Sharif. A portrait of our friend and partner Noor Mohammed in Bamyan. He’s one of our favourite people in the world and his story and vision are inspiring. Here he’s wearing a patu (blanket) and head scarf to stay warm in the strong winds of Bamyan Province. Perhaps the most ubiquitous symbol of Afghanistan’s women is the chadri, or commonly called a burqa in the West (burqa is the Arabic term, whereas chadri is Dari/Persian). Here, a woman poses in a burqa shop in thee northern city of Mazar-i-Sharif. While no longer mandatory, many women in Afghanistan choose to wear the burqa out of safety and protection, while others do so out of a sense of obligation, and others may be forced to by their families. The debate rages on domestically as to the place for this piece of clothing. Want to travel to Afghanistan?